A Music for Humanity Benefit Concert – Saturday 6 February 3:00 p.m. This program is the dream of a young artist who wants to pass to the next generation the gift he received when in need. Help support the ability of Music for Humanity to continue it’s scholarship grants. 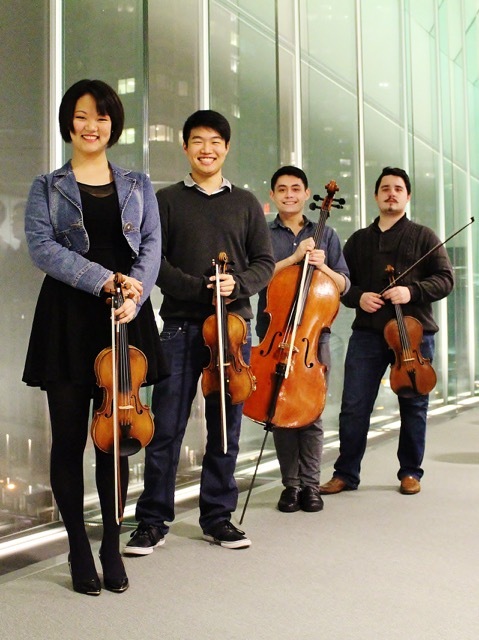 The Nova Quartet met in January 2015, all sharing a great deal of passion towards chamber music. They were selected as one of four groups to participate in Juilliard’s honors chamber music program from September 2015 to May 2016. Since last September, they have been working together almost every day and performed in various concerts, constantly aiming for a higher level of string quartet playing. They are currently working towards their main recital project as an honors group in March. The quartet is being coached by Laurie Smukler, Roger Tapping, and Joseph Lin. is a non-profit organization that helps young musicians receive the high-quality education they need to fulfill their passions and use music to contribute to the world. It is Music for Humanity’s mission to create a better world through music by supporting young musicians who are committed to making a lasting impact in their communities.